Victorian Etched Glass Window Film, available in one sheet size, 99cm x 69cm. Please add the quantity you require in the box above. 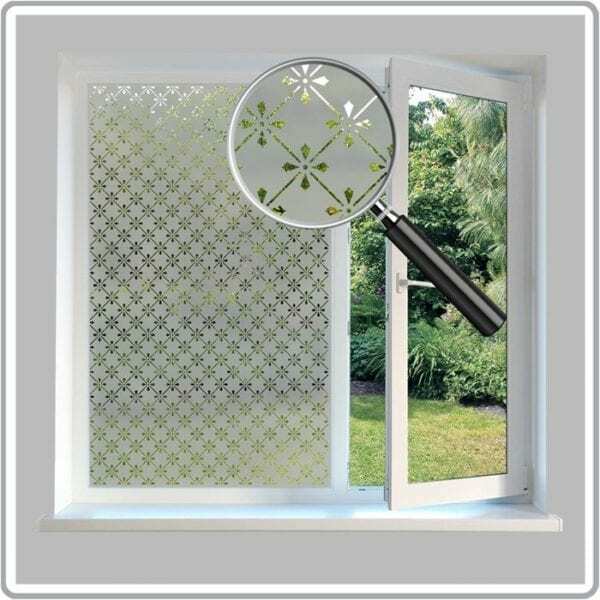 If you’re looking to add style and atmosphere on a budget, then our traditional value frosted etched glass film will help you create style for less as it’s up to 30% cheaper than standard materials. The film is produced by having an etched glass effect print, printed onto a clear self-adhesive vinyl. Once fitted, the film will give the appearance of sandblasted or etched glass and give excellent privacy whilst still allowing 80% of light through. This film is an easy to install self-adhesive film that’s applied directly to any smooth glass surface. Your order is supplied with a free plastic squeegee to help with installation and easy to follow fitting instructions, or if you’d prefer for one of our trained window film fitters to fit the film for you, then please contact us for a free no obligation quote. If you would like to receive a sample of this film, then please use the ‘FREE Sample Service’ page at the bottom.